This entry was posted in Australian Landscapes, lancelin, Sunset Photos and tagged australian landsape photography, Australian Landscapes, honda crv, jamie paterson photography, lancelin, lancelin sand dunes, sand, sand dunes, sunset. I can see why you love this Jamie it is very nice indeed and must be a great reminder of a great day! One thing, is the Lancelin sand not almost white or is there yellow as well? I always appreciate your comments, they do help. This photo was taken from the cover of my car as the wind was blowing so hard I couldn’t possibly get a shot without risking covering my camera in sand. Having said that I did run out and almost do a commando roll onto that S curve to try and nail a few shots (probably looked really funny to anyone looking) but I just couldn’t focus or frame it as I was getting heaps of sand in my eyes, I decided my camera was worth more than the shot. It was amazing Flemming, sand from that dune was blowing 20M across to the other dunes! I will definitely be up there this weekend or the next to try and sit on that S curve late in the evening to get a good shot of it. The first row of sand dunes are very definitely white, and in fact most of them are white, but there is a bank of sand dunes that are yellow and some how they nearly always seem to have the best formations! 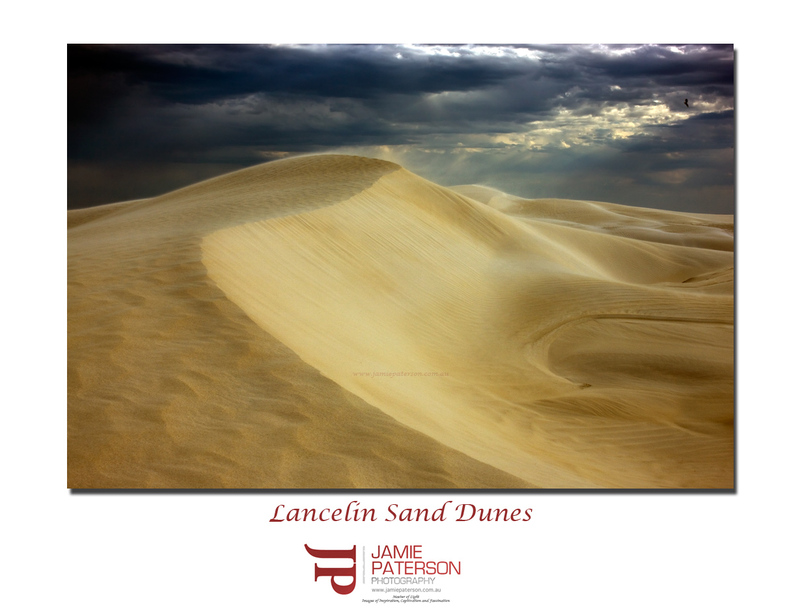 Lancelin is a challenging spot to shoot purely because of the high winds. Hopefully on your next visit it isn’t so blustery. Thanks for that mate. Can’t wait to see some of the shots you got with Neal. Thank you as always for the comment. I saw your photos. The wall photo was pretty cool. Hey jamie great shot, awesome cloud formation and light. Agree with FB Jensen’s comment about isolating the s bend. I want to head up there soon. Add some images to my portfolio ! So Flemming is now FB? lol. Thanks for commenting mate. I’m definitely heading back up there up again over the next few weekends when the wind isn’t so fierce! Excellent shot Jamie. Love the colours and tone. Must get up to Lancelin, haven’t been there for something like 18 years! Thanks for the commment. You should definitely get up there. Its awesome fun and so much to shoot. Only issue is that some people are pretty scary when driving over the dunes. Looks like a storm coming from the left. Mate, head to Marble Bar for a camp , Flemming will soon be the owner of the Marble Bar Resort Tourist Park. See my blog for the full story. Just had a look again and I see a Wedge Tail Eagle in the top right side. Yes I was pretty luck to capture that. I reckon your best yet mate! That I have seen anyway! I’ll take that one! Thanks very much for the great comment. Nice one Jamie ! I love the composition with the curve/flow of the dune through the shot and the drama of the sky gives it… well… great drama ! Thanks for the comment. I have to admit I love the clouds / sky in this shot as well. That is a pretty impressive picture. I love the contrast between the sky and the dunes! Did you have a 4wd to drive further into them? Wedge Island is nearby and quite an awesome place. Thank you for taking the time to comment. I’m stoked you liked the photo. I do have a 4WD and Wedge Island is definitely on my hitlist of places to visit very soon. I’ll probably head up there in January or February for the weekend. What a great photo! Could I please have your permission to use this photo for a uni assignment? Because you asked you certainly may use this photo for your assignment, I hope you get a great mark!